SERCUL is a sub-regional organisation that operates within the metropolitan and periurban areas of the Swan-Canning River Catchment. 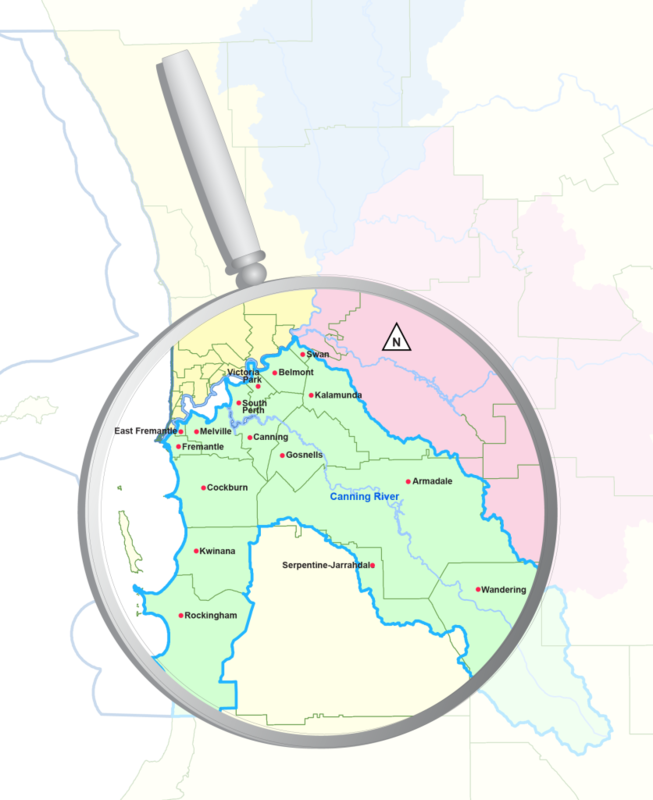 The area covered takes in most of the southern and eastern suburbs of Perth and includes Dyarguu (the Canning River), the Southern-Wungong River and parts of Derbarl Yerrigan (the Swan River). SERCUL comprises of a committee made up of community members, local governments and state agencies; staff that work under regional programs and the Landcare Centre (Yule Brook Homestead). SERCUL are very fortunate to have Chris Ferreira, an outstanding advocate for landcare over many years, as our patron. SERCUL, as an incorporated, independent community environmental organisation, is able to bring together the community, Local Governments, business, educational institutions and Government agencies to plan for, develop and implement projects that will improve the natural environment using a strategic and integrated approach. Our staff work with the SERCUL Strategic Plan to implement goals in the south region of Perth from programs focused on the broader Swan Canning Catchment including the Swan Region Strategy, Swan Canning Water Quality Improvement Plan and the Healthy Catchments Program. Under this structure individual staff are focused on one of two program areas – Community Support and Education and Landcare. SERCUL staff undertake and/or manage a variety of projects in these program areas with most projects overlapping to meet multiple objectives. Regional Development and Science, Research and Innovation are intertwined in all program areas. To have, as a given, the Natural Resources of the South Region of Perth managed in a healthy and sustainable manner by all stakeholders for future generations. The aim is to use integrated natural resource management to develop cultural change in how the community views and interacts with the environment while promoting and actively participating in, the improvement of the health of waterways and other ecosystems within the South Region. To identify priority Natural Resource Management issues in the South Region in partnership with Local Government, State Government and industry. To ensure biodiversity within the South Region is monitored, protected and enhanced. Assist Community, State and Local Government in the coordination of Natural Resource Management in the South Region. Support and encourage the implementation of best management practice of Natural Resources within the South Region. Recognise and embrace Aboriginal, cultural and natural heritage. Foster research on matters relating to the South Region’s natural and cultural heritage. Work in partnership with Local Government, State Government and industry to educate the wider community to protect our natural resources. Support and encourage the formation and training of community environment groups. Support the development and implementation of projects that occur outside the South Region that align with and benefit the delivery of the SERCUL objectives. Administer the South East Regional Centre for Urban Landcare Inc. funds to promote the objectives and outcomes of the Association. Undertake on-ground activities to improve the health of the catchments including revegetation, river restoration, water quality monitoring, fauna surveying and community environmental education. Hold annual general meetings and quarterly community meetings. Run volunteer and special event celebrations such as Clean Up Australia Day, National Tree Day and National Water Week. Support other environmental groups in the region. SERCUL is proud to support the many community groups and individuals that undertake environmental work in our region. We can offer support to obtain funding, provide technical advice, help promote activities and host a simple website. Our office is also available for photocopying, computer and internet use and faxing. We are also building a fantastic library of environmental books and resources for the community to use. All ‘friends of’ groups and individuals working (or wanting to work) to help our environment are welcome to contact us or drop in and see us.